Eyewear is a must have any time that you go shooting whether that be at an indoor or outdoor range. Now there are some differences that are going to occur when you are outside vs. when you are inside with regard to light and reflectivity. Things that can vastly affect your ability to shoot as you normally would. So wouldn't it be nice if there was a set of glasses that could adapt with you no matter what sort of light source you are going to be shooting in? Since SHOT Show Riley and I have been wearing these glasses as our daily sunglasses just to really put in as many hours as we could using them. The CTRL One glasses make the claim of being the fastest auto-tinting glasses on the market. They have a manual or automatic mode. When set to automatic the glasses will automatically tint dark or revert to the light setting based on UV light. In manual mode you can toggle the tint on and off with a small button on the left frame of the glasses. In that regard the glasses perform perfectly. At the range as we walked into the trailer the glasses would light right up making it easier to see. Walk out of the trailer back to the shooting berm and they would tint right away. As the sun went down the glasses would go back and forth depending on where I was standing and which way I was facing. It was super convenient. The glasses meet the ANSI Z87.1 standards. They have been tested to withstand a.15 mm projectile from 2 yards traveling at 700 fps. 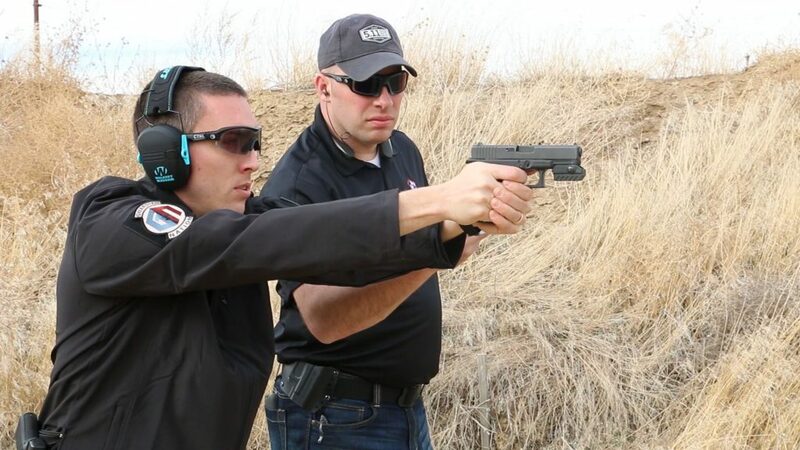 While Riley and I didn't perform any tests we felt comfortable based on our conversations with the company and the ANSI test to move forward with using these glasses while shooting. They do a good job of wrapping around the eyes and giving good protection. Riley and I were both satisfied with the comfort of these glasses. I often find glasses that I can't wear for more than an hour or two because they are too tight or don't have a good enough eye bridge but these CTRL One glasses were comfortable. We both wore them for 8 hours straight that day honestly forgot they were there. At SHOT Show they told us the glasses would run for 72 hours on a single charge. I ran the glasses for about 2 weeks without charging them. One of those days I had them on automatic mode for about 9 hours on the range. So I can't for sure if the 72 hours claim is good but they last a long time and if you were to charge them up before you head outside for a day or two you would for sure be fine. I'm not a guy who can speak fully to style… I can hardly match my own socks. What I would add here is that the glasses are available in various colors and designs. You can see from the above picture or the below video that Riley and I have two different styles… though both in Black. They are also available in combinations of red, white, and black. The cost of this product is the downside. The glasses run $299. Certainly that is on the high end of the sunglasses market but super high relative to what most of us would consider for shooting glasses and going to the range. For more information on the CTRL One and to see how you can pick up your own pair, click the link at the bottom of the page. You guys do an awesome job however, who in their right mind would pay $299 for a pair of glasses that auto tint. I would Thayer out $299 towards something that would truly help me defend myself. Again thanks for all you don but tihisnknw missed the mark. for light changing situations. When I go shooting, I ALWAYS use tinted SAFETY glasses.